A 16-piece tool dubbed the world's most sophisticated Swiss Army knife is to help dismantle the Dounreay Fast Reactor (DFR) in Caithness. The device cost £20m to design and build and will operate in highly radioactive conditions inside Dounreay's landmark Dome. Its detachable tool bits cost £100,000 each and weigh between 37-93kg. They will cut and grab 977 metal rods once used to "breed" plutonium from uranium. Measuring about 2.5m (8ft) in length, the rods resemble thin sections of scaffolding. UK government agency, Nuclear Decommissioning Authority (NDA), has proposed transporting the metal, which is known as breeder material, by train to Sellafield in Cumbria to be reprocessed. The new 4m (14ft) long device has been moved into position above the DFR's reactor vessel, ready to be lowered into the darkness of the reactor vessel where it will "harvest" the metal rods. Before this work can start, a liquid metal will have to be drained from the vessel over the next 12 months. The tool is also being put through a series of "robust" tests and its operators are receiving training. Once in place, the device will operate in highly radioactive conditions and in a nitrogen atmosphere. Nitrogen prevents any residue of the liquid metal from reacting. Exposure to water or oxygen would cause the metal to catch fire. Alex Potts, the engineer in charge of the Dounreay Site Restoration Limited (DSRL) project, said it was too dangerous for people to work inside the reactor vessel. 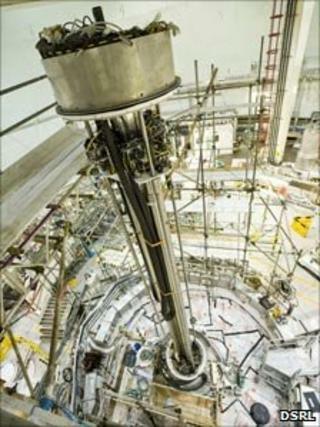 He said: "The reactor was a one-off design and so is the tool we need to take out the breeder rods. "It's too toxic in there for anyone to do the job manually - the radiation levels are still very high and the residual traces of liquid metal coolant add to the hazard - so we need a tool capable of doing the job by remote control. "It's a pretty sophisticated version of a Swiss army knife the team came up with." Up to three tool bits will be in use at any one time and can be replaced by another three carried in a special tool box without the need to remove the tool itself from the reactor. The rest of the tool bits will be stored above the reactor and would be fitted into place during service and maintenance breaks. Special radiation-proof cameras and spotlights will guide operators working around the clock in a control room 6m (20ft) above the reactor. The device, designed and built by French firm Framatome, is among the most expensive in the Dounreay "tool box". Others include a £100,000 pipe crawler, a device described by its operators as a hi-tech worm, which was deployed to probe the condition of a pipeline once used to discharge radioactive effluent from the site. A van-sized machine has also been retrieving radioactive particles from the seabed near Dounreay. But project costs have also been cut with the use of household cleaning products in the clean-up of equipment removed from the experimental nuclear power plant.